Also known as Putri Nyale Beach, Kuta on the south coast of central Lombok is one of the most scenic and unspoiled beaches in this part of Indonesia. 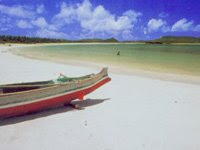 From Kuta to Tanjung Aan five km away, it is an unbroken stretch of clean white sand on the Indian Ocean. It is safe for bathing and swimming. Further to the west are the surfers and wind surfers beaches. Each year, on the 19th day of the tenth month of the Sasak lunar calendar on February or March when the Nyale fish come to the sea's surface, Kuta Beach is the site of great festivities. Fishermen sail out to sea while young men and women gather along the beach to join in the merrymaking, tease each other and perhaps meet to build a more lasting relationship.